Every few weeks we'll have a chat with a different mum or dad. They'll tell us how they manage to keep their life in balance; highlighting the struggles and the achievements. It's time to struggle together rather than just pretending to be okay and happy all the time, right? This week I had a chat with Rachel. She shared her thoughts and experiences about being a parent, what she finds the most important, and how she goes about raising happy kids. What does your life look like at the moment? We live in a Town House in Raleigh , North Carolina, but are originally from New York. We have three beautiful children , Eva ( 5) , Elsie (4) and Ethan (1). Our oldest Eva, was born with Trisomy 21 (a genetic condition) also know as Down Syndrome. She is more than a blessing to our family; she brings joy and enhances our lives. 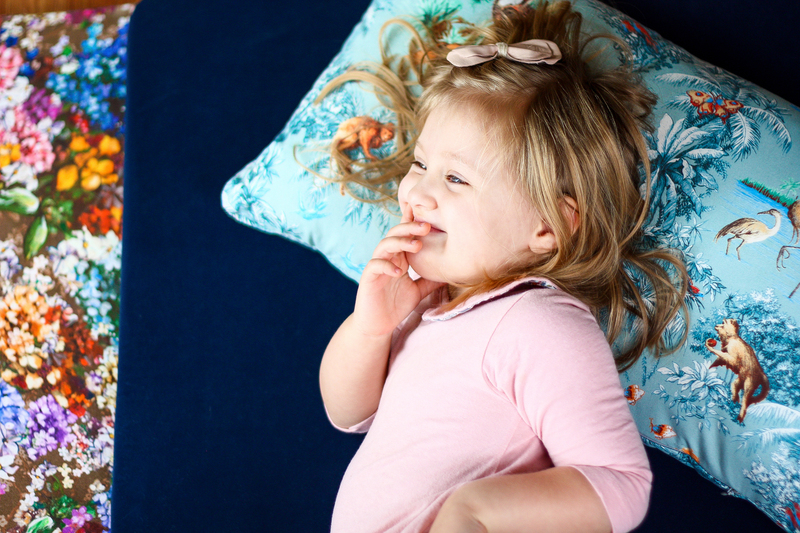 Her diagnosis does NOT define her , and she really is more like other kids than different! 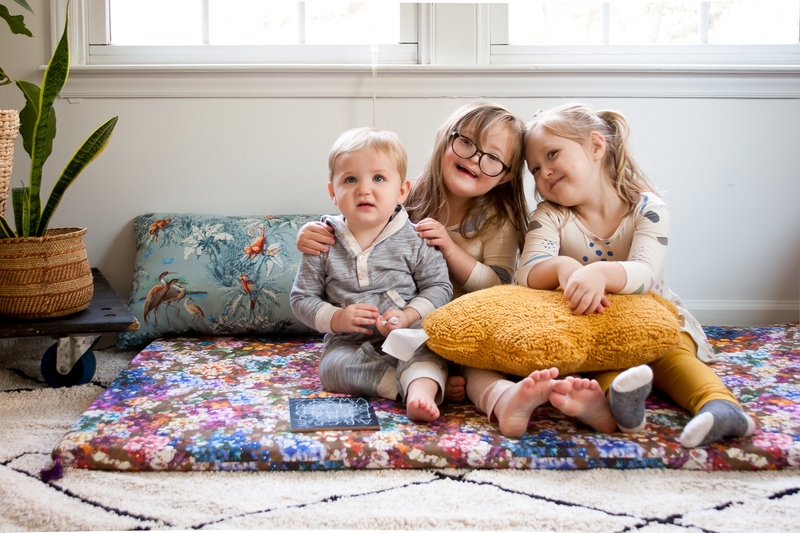 Children with Down Syndrome (like Eva) are capable of playing and learning just as other “typical” children do , they just may play a little differently or learn things at a slower pace. It doesn't mean they wont learn things, achieve their goals , or their dreams because they are capable of anything! From the moment Eva was born, we realised that every toy and book was so important to her. She didn't comfortably walk until she was 2.5 years old, so toys that helped her walk or balance on were crucial. Toys like “Rody” and toy shopping carts helped her hit her milestones. It's always great to have toys that make children happy, but for us toys also needed to serve a purpose. What is your philosophy about raising kids, what works for you? Looking back on my own childhood, I really appreciate and am truly grateful for all of the many experiences that my parents had shared with my siblings and I. We were so very fortunate to travel , and to learn things from horseback riding to figure skating, sports and dance. My father was also an artist , so he instilled his love for art and music in us, and my mum loved plays and theatre. They also taught me the importance of family, being open minded, being kind to others, being accepting of differences, and to set ourselves apart from others. They also loved to celebrate (even throw a party) for the smallest victories or special occasions, and just to live life to the fullest. I would really like to follow my parent's example when raising my own children. Their kindness for others and acceptance of differences has played such an important roll for me as a parent today. Especially, as a parent of a differently-abled child. My husband was also brought up similarly with many of the same beliefs and values, and I believe that because of those beliefs and values, my husband and I were able to see so many blessings at Eva's birth when others struggle with such news. What's important to you when it comes to toys and playing? We had two kids after Eva, so we still continue to provide toys and tools of play that help develop fine and gross motor skills, or social /emotional development and imaginative play. That's what we find important when it comes to toys and play . Watching Eva grow (and now applying that same knowledge to our other two kids) it's also SO important to “play” to their strengths but also their weaknesses. Eva loves books, dancing and creating art so we incorporated that into a space that gives her room to dance , and a GIANT chalkboard wall that she can always draw on. My daughter Elsie really loves to help me out around the house and do “grown up things”, so we created a space for her to “play house“. Ethan at this point just likes to constantly move around, so we have given him toys that he can move and groove on, while on top of of a ByAlex playmat of course. What's your favourite form of play when playing together? We really enjoy sitting in a space whilst encouraging the kids to facilitate the play. We just go from there and follow their lead. We also enjoy working on arts and crafts, doing puzzles and dancing with them. We have a portable speaker that works on bluetooth and are able to play music (along with the speaker ) in any room with just our phones! We think everyday should be filled with music and dance , it offsets the lower points of the day because let's face it , parenting small children is tough. 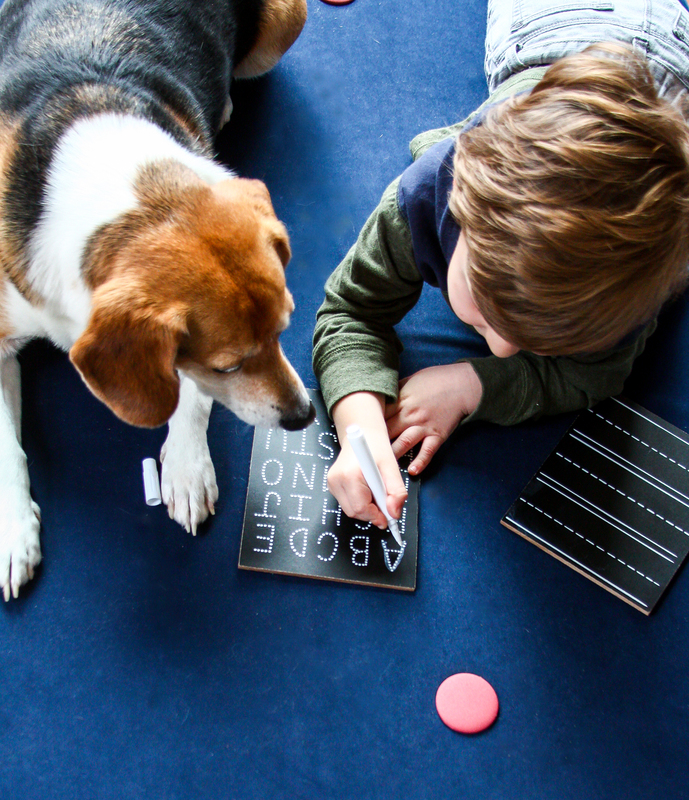 What do you find most important when it comes to your interior, especially in the playroom? I am constantly moving toys and furniture around the house and in their rooms/playspaces to adapt to their needs or current fascinations. I also think it's important to rotate toys and move toys so that everything seems fresh and exciting to them. Our ByAlex playmats also move around the house ALL THE TIME! Being a former artist and art educator has also helped me think outside the box when it comes to play. I love creating things for my kids and doing DIY projects. I just refurbished a cabinet we found in a dumpster and made it into a play kitchen (see photo). How do you use the ByAlex Playmat? As I mentioned above , the playmats move around the house all the time. Elsie has been taking gymnastic classes, so she loves to tumble on hers. They're also great padding for when your children are on top of toys that move, like Ethan's wooden toy horse. We also like to put our playmats on the side of Eva and Elsie's bed. They are hard sleepers, but tend to move around a lot at night. Just in case they fall out, we have the playmat there. Elsie has also recently refused to sleep in her bed and preferred sleeping on the playmat. We let her sleep on the playmat now and again at night. 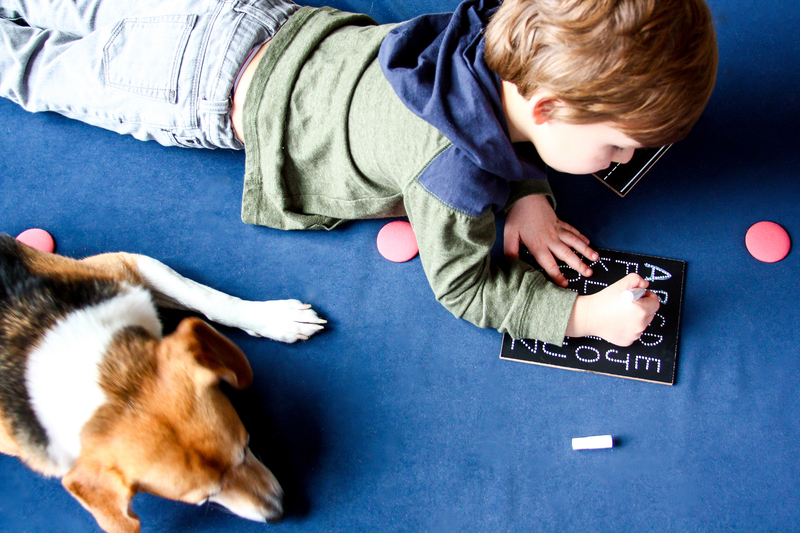 But I think the preferred or most used playmat spot is wherever we have chalkboards for them to draw. In Eva's room along the big chalkboard wall, and in Elsie and Ethan's room where the magnetic chalkboard fireplace is. It's also perfect to just relax on. We have even brought ours outside on dry days. 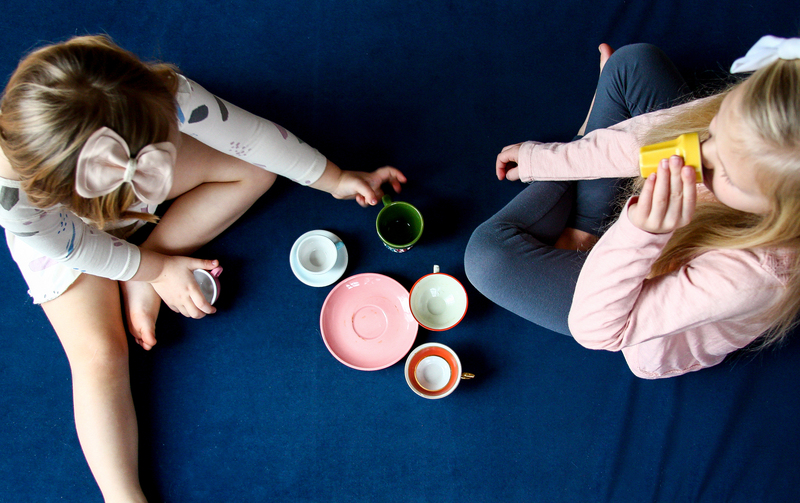 What's the best moment that you share with your kids on a daily basis? Since Eva has to work harder to learn new things, we REALLY DO celebrate the moments where she has learnt to overcome an obstacle or try something new. But of course it always warms our hearts when ALL of our children experience something new, overcome their fears, show kindness to others, or independently act on their own. We love to see their excitement. We also try to have alone time with all of the children (on a daily basis), and have one-on-one time with each of them. I really love getting to know my children and their growing personalities. How do you hope your kids will remember you when they're all grown up? My husband and I are kids at heart , and we love to be silly and laugh. I think we both don't take ourselves too seriously , and I think they can see that in our day-to-day handling. We love to laugh. I hope they remember us as being loving, kind and comforting but also hard working. My husband and I both work from home, so even now they get to see that sometimes you need to work hard and be dedicated to make your dreams come true. It might be a little cliché, but we truly are people that believe in the saying “work hard, play hard , and be NICE to people”. I hope that stays with them when they are older. and we can start chatting. I'd love to hear from you!